My brother Bob parked the car in the crowded parking lot at the entrance to Payto Lake. Gathering our gear, we were soon on our way. The first thing I noticed was the large crowd of Chinese tourists. Where ever we went they were there. We picked up the Peyto Lake trail. There was snow in the bush here. Hmmm, interesting. We made our way along the trail, passing out coming tourist along the way. We finally arrived at the viewing platform. The photo above was one of my many creations here. 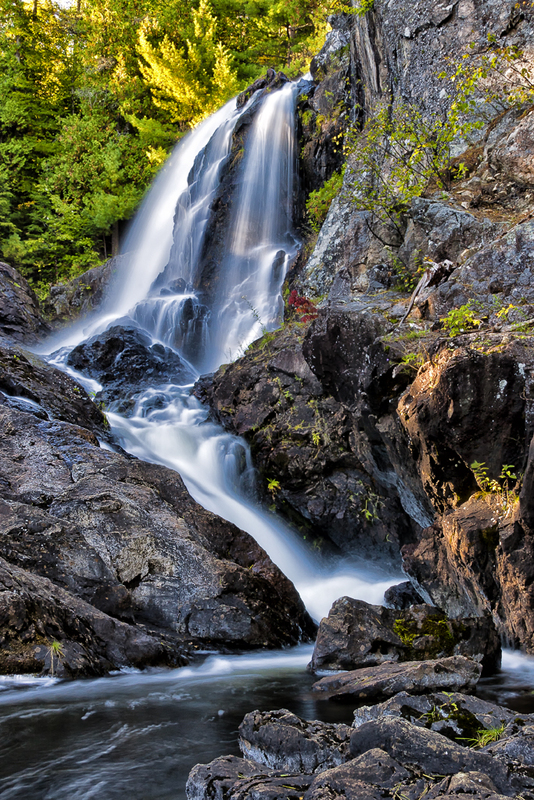 Waterfalls have always interest me as a subject matter.In my part of the country I am blessed with a fair amount of these waterfalls due to the rocky terrain in Northern Ontario. The trick is to photograph these locations when the right amount of water is flowing over.By utilizing the rock structures and the path of the water flow you can come up with some interesting compositions.The above photo I was able to create a S curve with the water by getting in the right set up to compose the shot.The rock structure was high in detail and the sun was filtering through the trees at the top left.The time is late evening. 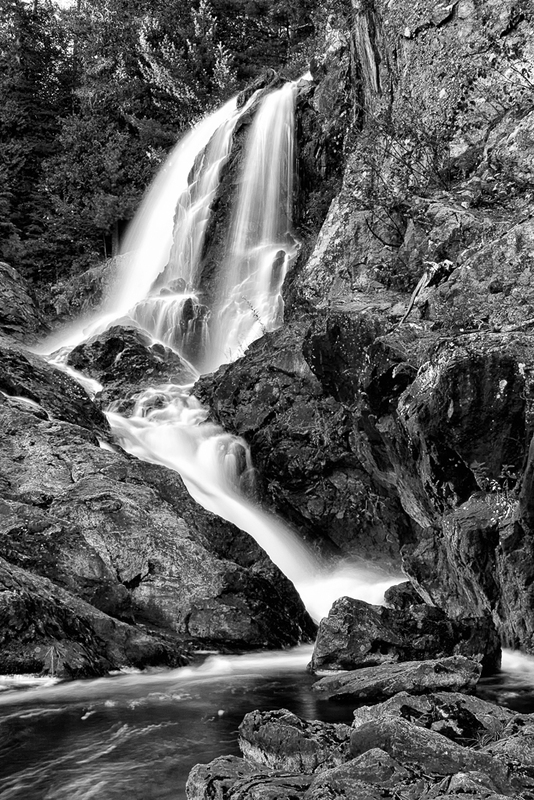 In most cases I do a fair amount of climbing up and down rock and boulders to get the best shot.I will not do it on a wet days.The rocks can be quite slippery. The photo above is the same as the black and white but in color.Looking at this one you with easily pick up the lighting effects at various locations.This is what helps make that extra detail in a composition. That is it for this week.I had problems with my internet this past week, so was not able to check out all the postings of my fellow bloggers.Thank you very much for your comments.Much appreciated.So until next week happy trails.